I knew from experience that if you aren’t in position to shoot the golden orb in relation to a landmark, forget it: you’re never going to get there in time. 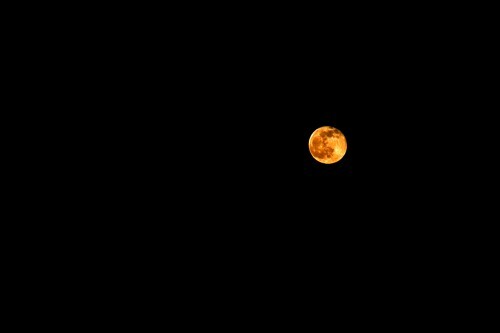 I putzed around in a fast food joint waiting for my order to come up, and wasn’t disappointed to see that the moon wasn’t visible when I left the parking lot. I didn’t really want to feel guilty about not making another full moon photo. The darned satellite was waiting for me, thought, when I hit the traffic signal at Mount Auburn Road. Fortunately, I caught the light when my lane was stopped. I shot it with the red light, too, but the green arrow seemed to work better for me. These won’t go down as my favorite moon shots, but they were too good to pass up. I love these shots. Alas, the leaves were too thick for me to see the moon last night. However, we get spectacular views when the trees are bare since our house faces east. 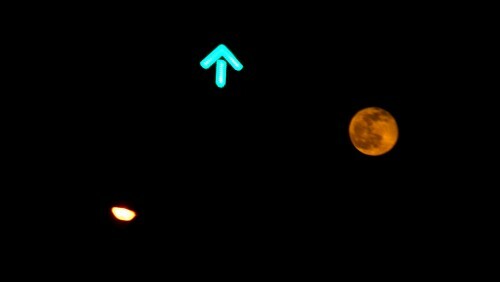 It would have been cool, although maybe goofy, to have had the moon in position above the green arrow.